One of the best things I have found for shifting cradle cap is organic virgin coconut oil. I experimented with ordinary coconut oil but that was a blend that I bought in a bottle. 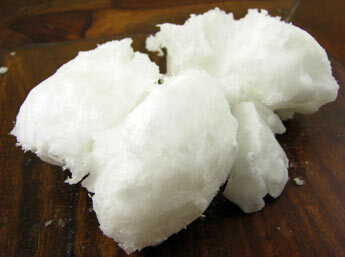 The virgin coconut oil comes in solid form at room temperature and has a distinct buttery, coconutty smell. The best time to apply the coconut oil is before you go to bed as then it can work its magic over night. You'll need to do it when you're planning to wash your hair the next day. To apply the coconut oil I run my fingertips over the solid oil, which melts it enough to cover your fingers. Then I run my fingertips over my scalp and keep repeating the process. You could melt a little of the oil first to make this easier (though possibly more messy too). It's quite hard just to get the oil on your scalp and not on your hair, especially if you have long hair, but luckily coconut oil also makes a great natural hair conditioner so there's no problem there. You might want to put a towel over your pillow though as it will soak in. The next morning you'll need to wash your hair very thoroughly to get all the coconut oil out otherwise you'll be left with greasy looking hair - even though it's clean! I found that as you concentrate your hair washing on the scalp and roots that it was easy to get it all off the roots but I sometimes ended up with greasy looking ends because I hadn't washed the oil off the ends enough. Organic virgin coconut oil has many more amazing uses - read my post 6 Beauty Uses of Virgin Coconut Oil.